We want to assure our customers that as soon as our engineering team became aware of the details necessary to reproduce the bug, they quickly disabled Group FaceTime and began work on the fix. We are committed to improving the process by which we receive and escalate these reports, in order to get them to the right people as fast as possible. What happened? A kid found the serious bug, his mother tried to tell Apple and they would not listen. That is not an Apple problem itself. All support people work on the premise that they are trying to fix user error, not a system error. I have a frustrating bug myself and I have no way of telling Apple about it. And I am really well connected. I have known the Apple PR contact for dozens of years and I consider him a friend. I have met the man who is responsible for the Apple Watch development and I have told him about the bug. I followed up with an email. But my complaint is just too small to register. It won't blow up to the same dimensions as the Group Facetime bug. What is it about? I want my friends to be able to locate me by showing my location in "Find Friends". 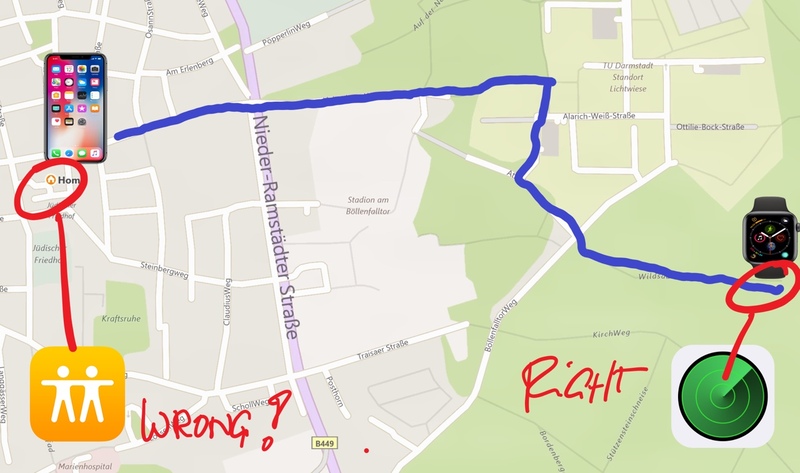 That is easy, if you carry your iPhone. But I don't carry my iPhone all the time. I want them to be able to spot me by the location of my Apple Watch. And this has been broken forever. So, here we go. @AppleSupport is going to find and fix the user error. I reach out and send them the requested information, explaining all the things I tried to fix it. Resetting Watch and iPhone, pairing multiple watches, etc. Thank you for the information about your Apple Watch and iPhone today. 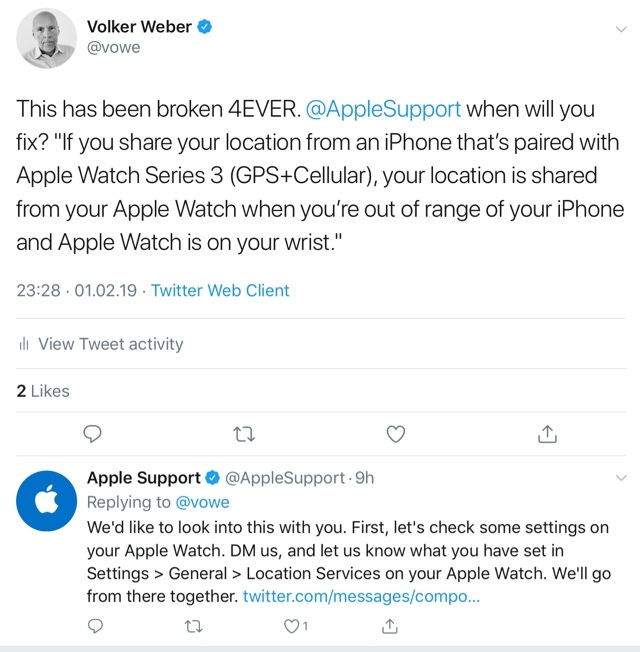 To transmit your location from your Apple Watch series 4, it would need to be away from your paired iPhone, and have access to cellular data. We'd like to check your cellular settings on your Apple Watch. Do you mind sharing a screenshot of the information found in the My Watch tab of the Watch app > Cellular? Oh yes, I know that. I can see the location of both the Apple Watch and the iPhone in two different places. And I have told you. Anyway, here is that information you requested. We appreciate those screenshots. We'd like to gather some additional information to help us facilitate the appropriate next steps. Would you mind providing us with your country or region? Well, my screenshots already provided that country or region. They contained my effing precise address. Anyway, since it did not register, I send it again. At which point the communication ends. Game Over. I give up. You cannot tell Apple that something is broken at their end without raising a shitstorm. It is such a small error. Apple has both locations. They just report the wrong one. And they can't fix it. So true! The latest ATP podcast from Macro, John and Cassey also addressed this very topic. Marco Arment (top-notch iOS developer of Overcast) is so frustrated filing bugs in Apple’s radar - he considers it a waste of time after having done that hundreds of times. I am pondering the idea of filling a bug myself but after all what I hear and read I probably won‘t. Did you for example notice that since Apple made a change so that HomePod allows for one Apple Music stream only (I don‘t have the Apple Music family plan) you cannot play e.g. Deutschlandfunk (a German news radio station) on one HomePod while playing an Apple Music based song on another one. Hell, you can‘t even stream the same radio station on two different HomePods at the same time if you invoke them separetly: HomePod A: Hey Siri, play Deutschlandfunk. HomePod A starts playing. HomePod B: Hey Siri, play Deutschlandfunk. HomePod B starts playing, HomePod A stops playing. Crap! Thanks, Volker. I had the same experience with Netflix. Their so called support is a sour joke, you can either call or chat with them. Then you need to stay on the line or the chat for hours, if you convince them to ask somebody in the US. They then say, that it is on your end and that is it. No way to escalate, get a ticket number, nothing. It is just a farce. My problem was, that from a certain version onwards, the Netflix client would not display FHD on Android anymore, only HD. I could show this in a consistent matter. I could show that iOS is fine, that it is neither account, nor device related but to the client version. I jumped through all the tires for them. Read about and checked Widevine DRM, used several devices. The problem is on XDA. Netflix just said "must be on your end" and were done with it. Customer support and having feedback loops with following investigation is just not happening with many big companies. Even ignoring formal bug reports seems just ignorant and outright stupid to me. Hubert, Apple is not alone. We know that. Can we focus on Apple for a moment though? For a company that takes pride in making everything easy and intuitive for the user, this is doubly embarrassing. First of all, it is obviously not easy for the user and secondly, if the reported errors really are mostly because of user errors, that would indicate that the products are not as easy to use as the company whishes. To quote John Siracusa: “Success hides problems”. And I am not even sure Apple would change when in trouble. We are doomed. Maybe regulation (like GDPR) can help, but often that isn’t solving the whole problem (like GDPR). My 2 cents: As long as companies don‘t need to fear any (monetary) consequences of their wrong-doing with respect to security issues, violation of consumer privacy laws, etc. the incentive to be proactive/react in a timely fashion is near zero. I recommend reading Bruce Schneier‘s latest book ‘Click here to kill everybody: Security and survival in a hyper-connected world.’ - he (as an American) is strongly advocating for putting policies/legislation into place to make companies liable for ignoring security aspects. 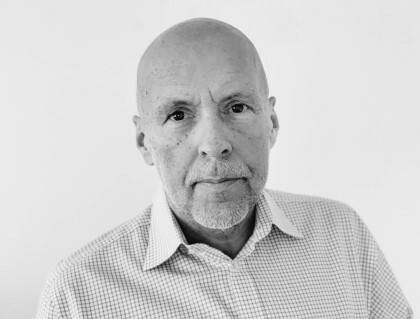 At the same time he states very clearly that today’s consumer is simply unwilling to pay extra for security (often times of course due to unawareness of the consequences security risks pose to their lives, businesses or society in general). The book is well worth reading - not necessarily to make you feel better but to raise awareness and maybe to make different purchase decisions today. Regarding Apple: I think they are doing a lot right but there’s of course tons of room for improvement. At the end of the day they are a corporation like any other. Maybe their internal moral standards are higher (which I am inclined to believe) but they are probably to big to be Robin Hood anymore. If you follow their earning calls and how the markets redact to everything Apple does you know what I mean. I don’t know about you, Volker, and your audience but whenever I raise a security related topic to friends and family they are completely clueless what I am talking about and how it might affect them. Advocating security topics has a long way to go and quite frankly I’m not optimistic that the everage Jane/Joe will ever get it (and who’s to blame them). Yup. Over the last six years or so I’ve logged errors concerning iCloud / iTunes / iDevice / music syncing problems. (In fact, the whole syncing thing has just gotten worse as macOS and iOS releases come along). Web-based reports to Apple just go into a black hole however, and there’s no sign of anything being improved, so I’ve given up. Vor nicht allzu langer Zeit hat mal jemand mit meiner Mail-Adresse einen Apple-Account eröffnet (ja, das ging / geht ohne Opt-In, zumindest bei iTunes). Da ich den Account samt Sicherheitsfragen nicht erstellt hatte (und das für diese Mailadresse auch nicht wollte), habe ich mich an den Support gewandt: nach langem hin und her wurde die Sache "disputed" und der Account wurde gelöscht. Alles gut. Antwort vom Support: „This is the second time this customer is contacting us to report that someone is using their email address without permission. The first time was in December on DSID xxxx. We will not be able to again dispute this email address as the custoemr has waited too long to take any action on their end, such as to create an account using it to prevent it from being set up as an unauthorized ID again." Ich muss also einen Apple-Account für eine Mailadresse erstellen, nur weil Apple seine Prozesse nicht im Griff hat.